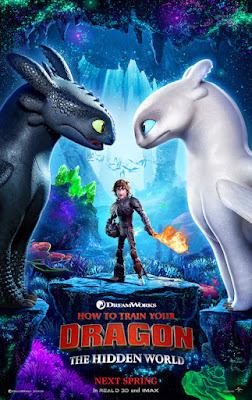 We're happy to offer our DC readers the chance to attend a free advance screening of How to Train Your Dragon: The Hidden World, the final chapter in Dreamworks' beloved animated franchise! SYNOPSIS: Now chief and ruler of Berk alongside Astrid, Hiccup has created a gloriously chaotic dragon utopia. When the sudden appearance of a female Light Fury coincides with the darkest threat their village has ever faced, Hiccup and Toothless must leave the only home they’ve known and journey to a hidden world thought only to exist in myth. As their true destines are revealed, dragon and rider will fight together—to the very ends of the Earth—to protect everything they’ve grown to treasure. The screening takes place on Tuesday, February 19th at 7:00pm at AMC Mazza Gallerie. To enter for a chance to win an admit-two pass, simply complete the Rafflecopter contest form below. Winners will be selected on Friday, February 15th and notified by email. Good luck! How to Train Your Dragon: The Hidden World opens February 22nd.